As you know I will be teaching workshops in both Brisbane and Adelaide in April 2012. 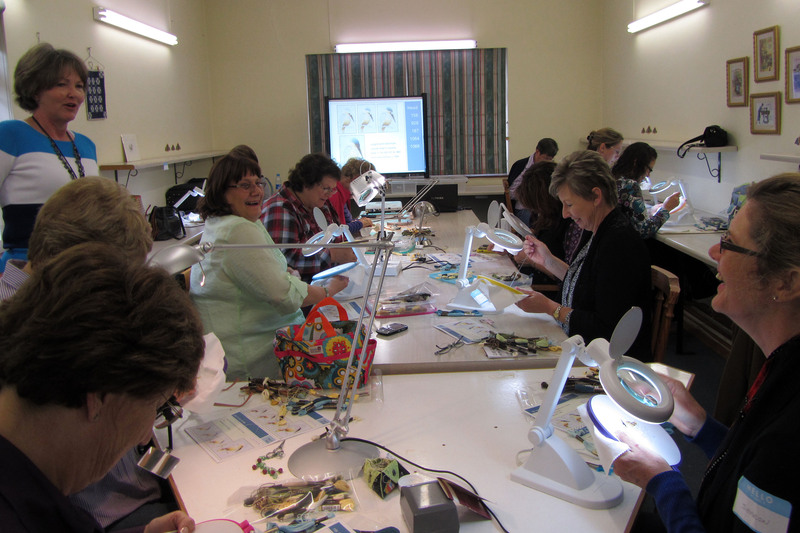 The venue for the workshops in Brisbane is All Threads Embroidery and there are 3 classes available. What you probably don’t know is that I run my classes using slideshows and video demonstrations projected onto a large screen. This always seems to come as a bit of a surprise to the students who attend my workshops! The large screen allows the whole class to see each step clearly whilst they stitch and I can replay demonstrations of the technique as often as needed. Each student has a printed colour booklet in front of them with step by step instructions, which duplicates what is on the screen, and of course can be taken home after the class should they need to complete the project in their own time. This method of teaching together with the fact that all the projects are designed to be completed within the class time, means that most students take home at least a 75% completed project, so you have something to show for all your efforts. I devised this teaching method after holding a large class at a convention a few years ago where I had to demonstrate a technique several times by hand, to small groups of people. The students were peering over my shoulder trying to see what I was doing and I found it slowed down the pace of the class. As a result I put my thinking cap on and set about researching a more efficient teaching method. I have used these technological aids since and found that as a result I am able to give each student more individual attention and it allows for a more relaxed workshop environment. Below is a photo of a class run in South Africa to give you some idea – the screen is shown at the top of the table. MONDAY 9TH APRIL – Frangipani Flower. One day class. 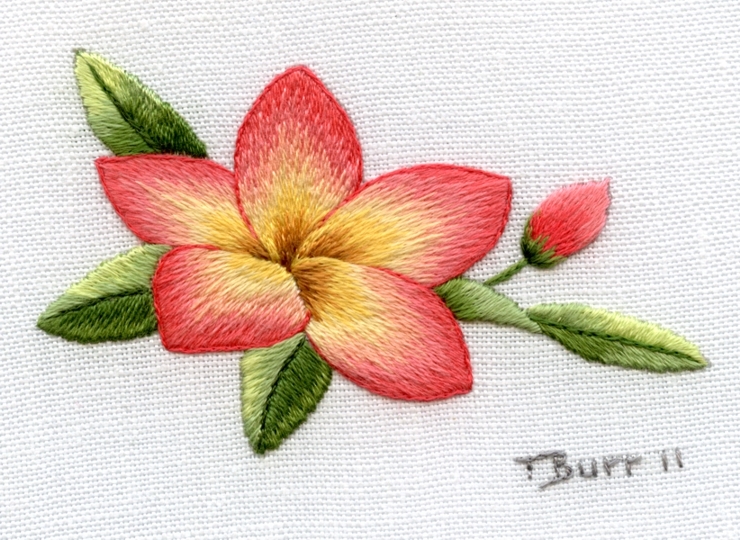 This little frangipani flower is the ideal project for beginners to learn the basics of needle painting embroidery. No previous experience in the technique is needed, the student will learn the fundamentals of long and short stitch plus how to direct their stitches to fit a curve. 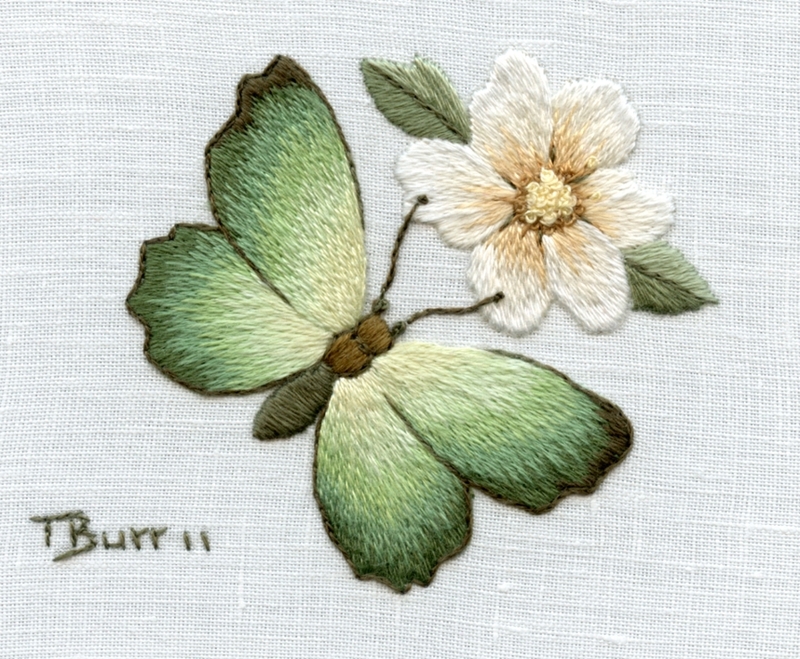 You will be taught how to shade using contrasting colours to enhance your embroidery and to achieve a realistic effect. Having completed this project you should feel confident to move onto more intermediate designs. This little green butterfly resting on a flower is the ideal project to learn the fundamentals of long and short stitch. Again this class is suitable for beginners and will cover all the aspects of the Frangipani class. A butterfly is a particularly useful design to stitch as the stitching learnt on one side of the butterfly is repeated on the other side. The flower is designed to fade into the background so does not detract from the focal point of the picture which is the Flutterby. THURSDAY & FRIDAY 12TH & 13TH APRIL – Blue Kingfisher. Two day class. 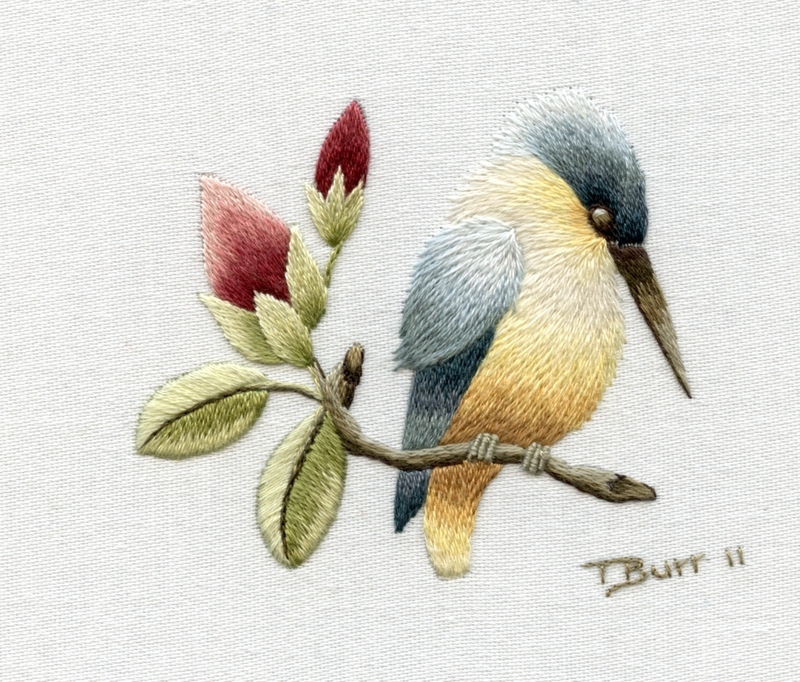 This is a re-design of our favourite little kingfisher bird, gazing down into the water below in search of a fish. This class is more suited to the embroiderer who has some previous experience of the technique and would like to perfect their long and short stitch plus learn how to stitch feathers. Again we will cover the use of colour and how it enhances our embroidery plus learn to include shades that provide contrast and a realistic effect. The flower and leaves add a complementary touch of colour to the blues of the kingfisher. At the end of the two day period I will give a presentation on colour for embroidery. If you are interested in attending any of these workshops please contact Kerryn Lightfoot at All Threads Embroidery, I believe there may still be a few places available. email: kerryn@allthreads.com.au or telephone: 07 33985540. Those of you who have pre-booked a place will be receiving class preparatory notes shortly. You may be interested to know that several new kits have been produced exclusively for the Australian classes and will be available for sale at the shop venue during the workshops. Previous Post Calling All South Africans. part suggest to my friends. I’m sure they’ll be benefited from this site. a daily basis. It’s always helpful to read through articles from other writers and practice a little something from their web sites. of plagorism or copyright infringement? My site has a lot of exclusive content I’ve either created myself or outsourced but it looks like a lot of it is popping it up all over the web without my agreement. Do you know any methods to help stop content from being ripped off? I’d really appreciate it. What’s up colleagues, its wonderful post about cultureand completely defined, keep it up all the time. Trish, you know you are the most talented person I “know”. The Frangipani flower look so real, I feel to put my nose against it and I am sure I would feel the coolness of the flower. That is one thing on my wish list,the opportunity to attend one of your classes.